DNA methyltransferase 1 antibody recognizes DNA (cytosine-5)-methyltransferase 1 , also known as Dnmt1, CXXC-type zinc finger protein 9, DNA methyltransferase HsaI, DNA MTase HsaI or M.HsaI MCMT. The antibody has been extensively validated for western blotting using whole cell lysates. Rabbit anti Human DNA methyltransferase 1 antibody recognizes human DNA (cytosine-5) methyltransferase 1, also known as DNMT1, CXXC-type zinc finger protein 9, MCMT or DNA methyltransferase HsaI. DNA methyltransferase 1 is a 1616 amino acid member of the C5-methyltransferase family, bearing 2 BAH domains and single CXXC-type zinc finger, DMAP-interaction and SAM-dependent MTase C5-type domains. The epitope recognized by Rabbit anti Human DNA methyltransferase 1 antibody maps to a region between residues 700 and 750 of human DNMT1. DNMT1 is a nuclear enzyme with a major role in the maintenance of DNA methylation patterns after replication (Song et al. 2012). DNA methylation is significant for epigenetic regulation of gene expression, X chromosome inactivation, genomic imprinting, and development (Lee et al. 2001). Overexpression of DNMT1 has been detected in several human cancers (Robertson et al. 1999). Rabbit anti Human DNA methyltransferase 1 antibody recognizes human DNA methyltransferase 1 as a band of ~180 kDa in multiple human cell lysates by western blotting under reducing conditions. 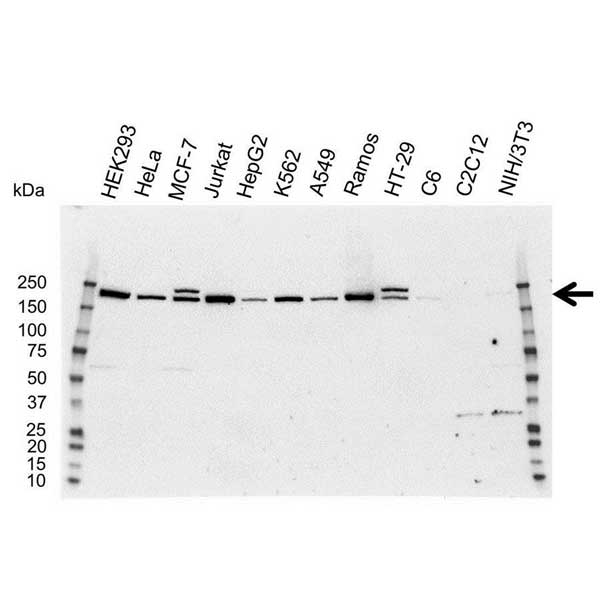 Anti DNA Methyltransferase 1 antibody detects a band of approximately 180 kDa in HEK293 cell lysates.